Our Reconciling Congregation stained glass. 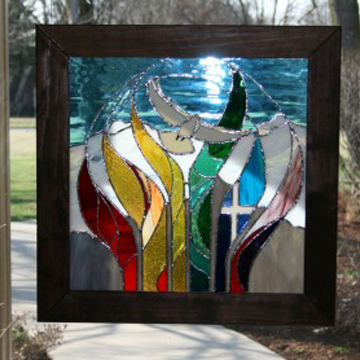 The stained glass window shown above was created specifically for Northbrook United Methodist Church by the artist, Paul Holzman, in celebration of Northbrook UMC becoming a Reconciling Congregation. Read the artist's introduction to the symbolism in the stained glass window. Our welcome knows no boundaries of race, age, ethnicity, sexual orientation, gender identity, economic reality, education, family status, physical or mental ability. We welcome all into full participation in the life of our congregation. The Reconciling Ministries Network (RMN) is a growing movement of United Methodist individuals, congregations, campus ministries, and other groups working for the full inclusion of all people in the United Methodist Church. Currently close to 500 communities nation-wide have voted to become Reconciling Congregations. For more information, please go to the Reconciling Ministries website: www.rmnetwork.org.